1. Mass is at 11.00 am on Thursday 10th March. 2. Children are to be seated in the church at 10.40 am. 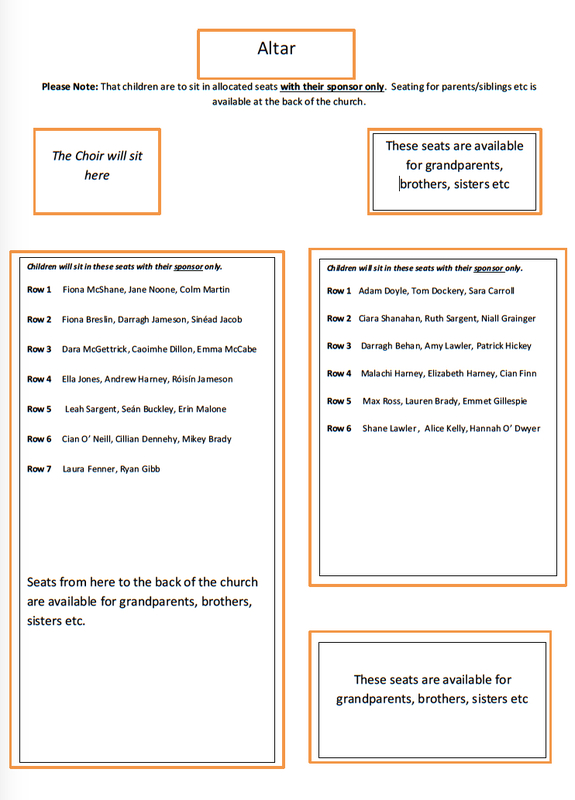 Confirmation pupils will be seated with their sponsors in designated pews around the altar. 4. Additional seating will be provided in oratory and meeting room areas however, please be considerate as seating is limited and we have 36 pupils receiving their Confirmation. 6. Children are to bring their baptismal candle to school on Tuesday 8th March. We are on Kildare Now ! Confirmation will take place on Thursday 10th March at 11.00am in Eadestown Church. Children are to wear their full school uniform (not tracksuit) and black shoes and are to be at the church 15 minutes before the ceremony begins (10.45am). Children will sit with their sponsor in allocated seats during the ceremony and parents/family will sit to the back of the church. Thank you for your co-operation and we hope you have a good day. Please note that the Ceremony of Light will take place tomorrow night Thursday March 3rd at 7.30 pm in Kilteel Church. There are refreshments afterwards in the Kilteel Hall and all are welcome. Children are to wear their school uniform (not tracksuit) on the night and are to bring their baptismal candle. Children are to be at the church ten minutes before the ceremony begins (7.20pm). Click on the seating plan below for a full size image. 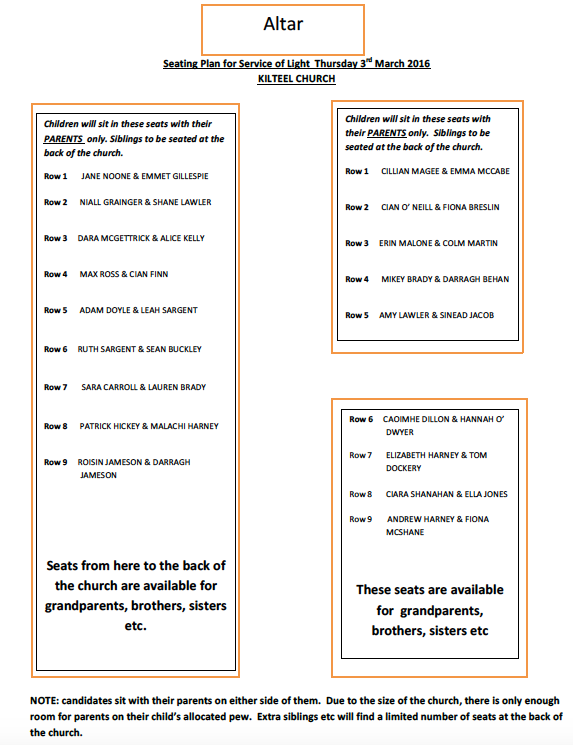 There will be limited seating for siblings and extended family as shown on the plan.